Rosalind (Bryce Dallas Howard) is the daughter of a duke (Brian Blessed) living among a community of Westerners in 19th century Japan. When her father is suddenly banished, the frightened girl is forced to flee for the Forest of Arden lest she risk being executed by her malevolent uncle. Joining Rosalind on her journey to the forest is her sympathetic cousin Celia (Romola Garai), who helps to pass her incognito kin off as a man in order to avoid detection. Later, Rosalind's clever ruse begins to serve a dual purpose when she determines to use the disguise to gauge the devotion of another exile, Orlando (David Oyelowo). 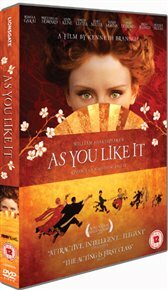 Rosalind (Bryce Dallas Howard) is the daughter of a duke (Brian Blessed) living among a community of Westerners in 19th century Japan. When her father is suddenly banished, the frightened girl is forced to flee for the Forest of Arden lest she risk being executed by her malevolent uncle. Joining Rosalind on her journey to the forest is her sympathetic cousin Celia (Romola Garai), who helps to pass her incognito kin off as a man in order to avoid detection. Later, Rosalind's clever ruse begins to serve a dual purpose when she determines to use the disguise to gauge the devotion of another exile, Orlando (David Oyelowo).